I wanted to treat my birthday boy to one last home-cooked meal before he turns another year older, so my creative act for the day took place in the kitchen. I love the healthy spin (ground turkey) and Mexican flair (black beans and corn). And it's easy, so this lazy chef was sold! Needless to say, we are stuffed. This one is going in my recipe collection, for sure! 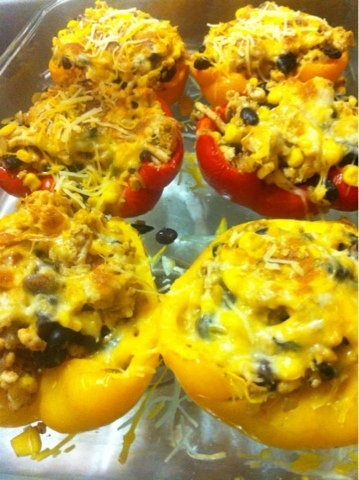 Try Table for Two's recipe for stuffed peppers! Recipe please!!!! Those look delish!